How you start your day determines how your day is going to unfold. Don’t leave it up to chance to have a great and productive day, but take control of your life, and get the most out of each day by implementing some healthy and helpful morning rituals to increase your productivity. So stop wasting valuable time and begin each day with a healthy mindset and a structured plan for the day. 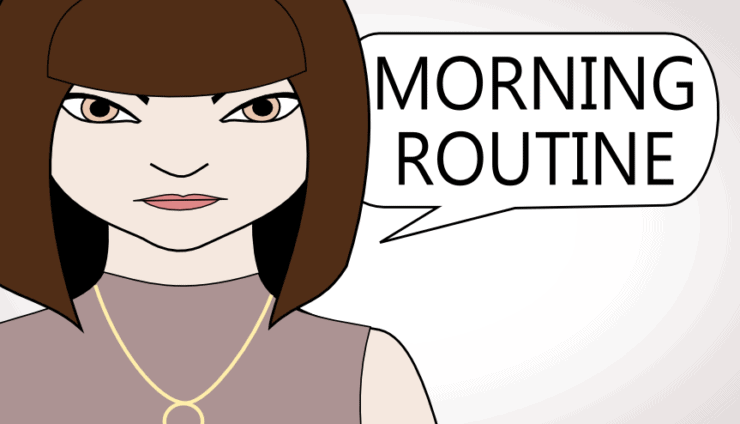 So here is a great morning routine for those of you who need more structure in your life. Follow these steps to get a good start to your day, and to increase your productivity. Start each day with a quick gratitude meditation before you begin your day. Take some time to show gratitude for all the things you already have in your life, even though you may want something more. Showing appreciation for what you have, changes your mindset, and help you to focus on abundance instead of scarcity. You automatically become a much happier and positive person when you realize that you are truly rich already… you are healthy, you have a home, you have a job, you have a family and so on… you have so much more than you realize. So close your eyes and focus on all that you have and feel grateful for. After you have done your gratitude meditation, continue with an affirmation and visualization meditation where you now focus on what you want. Make an affirmation for what you want to achieve, and then visualize yourself having already achieved your goal. So if you want to lose weight, say to yourself… “I am healthy… I am fit… and I love my body”, while you imagine being your ideal weight and enjoying life. Drinking a glass of water first thing in the morning on an empty stomach can help detox your body and cleanse your system of toxins. Eat a healthy and nutritious breakfast to give you the energy you need to start your day. So eat something with lots of vitamins, proteins and fibers to fuel your body and mind. Take a moment to just be mindful and aware of your surroundings can help pull you out of autopilot and make you appreciate life more. So go outside or open your windows and take in your surroundings… switching off your thinking and analyzing brain, and simply observing your surroundings for a moment. Every evening you need to make a plan for the following day, so that you do not waste time in the morning. Then look through that plan and get a clear picture of what you have to do today. Now categorize your tasks as either, A, B or C tasks; A being the most important and the things that need to be done, B being the slightly less important, and C being the least important ones. This will help you to know where you need to start so that you can be more productive and effective during your day. Stay far away from social media for the entire morning, and while you are working on your A tasks. You can easily waste precious minutes or even hours scrolling through useless updates and posts. So spend your time wisely and don’t log in to your social media account until you have completed your tasks and have some time to spare. Plan a small reward at the end of your day to help motivate you and excite you. This reward should only be something small, like allowing yourself to enjoy a good movie, spending some time on a hobby of yours, or whatever will make you relaxed and happy. So try out this morning routine and see if it increases and improves your productivity and help you deal with procrastination. Share your own morning routine rituals in the comments field bellow.